Clay Cliffs Natural Area is another one of those wonderful Leelanau Conservancy preserves that is small, easy to hike and has a trail system that leads to a stunning view of Lake Michigan. Wedged between Lake Michigan and Lake Leelanau with shoreline on both, the 104-5-acre tract contains less than 1.6 miles of trail yet in that short distance you skirt towering bluffs, enjoy two stunning panoramas and in the spring are greeted by a palette of wildflowers. 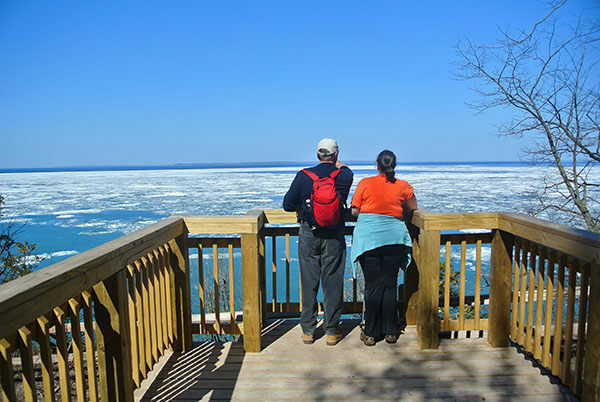 Much like Whaleback Natural Area just to the south on M-22, Clay Cliffs is a forested drumlin sculptured by glaciers and later waves resulting in 200-foot bluffs of glacial debris that rises dramatically above Lake Michigan. A portion of the area was once farmed and today the preserve is a mix of century-old hardwoods, cleared hayfields, open meadows and wetland seeps fed by springs. Its topography, ranging from the clay cliffs and hidden valleys to 3,500 feet of shoreline split between Lake Michigan and Lake Leelanau, provide a diverse habitat for wildflowers and wildlife. Clay Cliffs is one of the most prolific wildflower sites in Leelanau County, particularly trilliums in the spring, while its most noted residents is a pair of nesting eagles. The preserve’s trail system along with a trailhead parking area and an observation deck perched on the edge of the cliffs was built in 2014-15 and is basically a loop with a crossover spur. Though this hike is only 1.5 miles it does involve a steady climb of almost 150 feet in elevation and an almost equally long descent. For this reason, the preferred mode of transportation in the winter are snowshoes. At the trailhead the Young Forest Loop departs west and quickly comes to a junction where continuing west (right) is a path that was constructed in 2015. This segment passes under a power line, skirts a small meadow and arrives at a junction with the Field and Forest Loop. 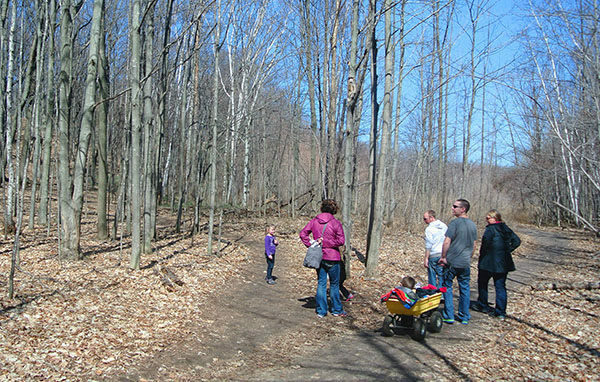 Head right to continue on the loop and prepare for a steady climb through a mature northern hardwood forest. In the next third of a mile there is a gain of 149 feet in elevation, reaching the high point of the trail, 759 feet, just before reaching the short spur, dubbed Manitou Passage View Trail, to the observation deck. The impressive wooden structure is reached at Mile 0.6 and allows you to stand over the edge of the steep cliff comprised of clay lenses, sand and gravel. 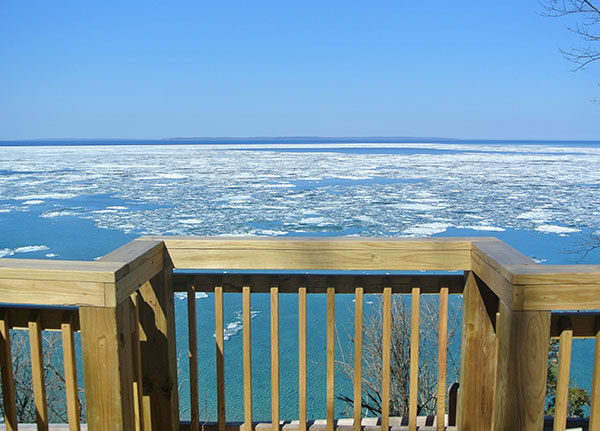 The view is magnificent, with the most prominent landmarks being North Manitou Island, whose southern tip is only 10 miles due west, and the perched dunes of Pyramid Point to the southwest. Between the two is South Manitou Island; to the northwest is South Fox Island. Backtrack to the Field and Forest Loop and head right to briefly skirt the cliffs — other than winter the hardwoods prevent a view of Lake Michigan from the trail. You then swing more due east and at Mile 1 break out into a large rye field where you are greeted with a view of Lake Leelanau surrounded by ridges, orchards and vineyards. It’s classic Leelanau. The view remains until the trail enters the woods and makes a steady descent, including a switchback, bottoming out at the junction with the Young Forest Loop, reached at Mile 1.2. Head right to continue on a wide trail that swings close enough to M-22 to hear the traffic. It also passes the rock walls of a Michigan basement, all that remains of the farmhouse that once stood there, before arriving at the trailhead at Mile 1.5. The trailhead at Clay Cliffs features a small parking area and an information kiosk but no source of drinking water or toilets. Clay Cliffs Natural Area is open year-round but in the winter the preserve is a better destination for snowshoeing than backcountry skiing. There are no fees for visiting the preserve. Clay Cliffs Natural Area is posted along M-22, 2.5 miles north of the village of Leland.